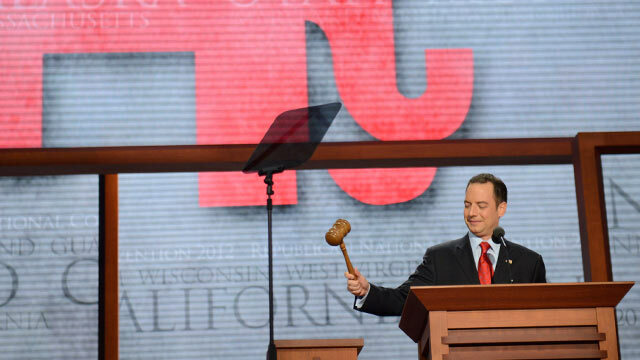 Republican National Committee Chairman Reince Priebus gavels open the RNC convention at the Tampa Bay Times Forum in Tampa, Florida, Aug. 28, 2012. Data was a big problem for Republicans in 2012. Now, they want to fix it by snagging a new chief technology officer from Silicon Valley. After President Obama's unexpectedly big win over Mitt Romney, the hagiographic lore has gathered around Democrats' data and targeting operation -- known as Project Narwhal -- which sliced and diced the Democratic voting base and allowed Obama's campaign to engage potential voters about the issues they cared about with shocking (to many) specificity and effectiveness. The GOP's purported counterpart, ORCA, crashed on Election Day amid a data deluge for which it wasn't equipped. And, beyond that, ORCA lacked ambition: It was basically an Election-Day turnout-reporting mechanism. Obama for America, on the other hand, had thought ahead, making a daring management decision to hire a tech team out of Silicon Valley -- one that was run by tech people, not political staffers, as had traditionally been the case -- to build a sophisticated database and interface that drove Obama's ground game to victory. Basically, the story of technology and 2012 goes something like this: Obama smartly hired tech guys and built a system that revolutionized political campaigning. Romney didn't. Obama is president. After losing in November, Republicans were quick to acknowledge they had a problem. On a private conference call after the election, Romney Campaign Manager Matt Rhoades urged top-tier Romney donors to pressure the Republican National Committee to update its data and targeting operation; unless it caught up to Democrats' technology-aided methods for targeting and contacting voters, Rhoades warned, Republican candidates would face a disadvantage for years to come. While Democrats reveled in their own foresight, Republicans far and wide started talking about the data deficit. It became clear that they wanted to fix it. As a first step in playing catchup, the Republican Party is now looking for a chief technology officer, aiming to recruit one from Silicon Valley by May 1, according to a Republican National Committee spokeswoman. "The RNC will significantly restructure our digital strategy, moving to center the RNC around digital and data, and fully integrate within the entire organization," RNC spokeswoman Kirsten Kukowski announced Tuesday. The RNC will unveil the fruits of its broad modernization effort, dubbed the Growth and Opportunity Project, next Monday. RNC Chairman Reince Priebus has visited Facebook as part of a nationwide "listening tour," during which Kukowski said Priebus had been hearing a lot about the need to update the party's data and technology operation. The idea is to restructure the RNC around technology, allowing the new CTO to design a budget that funds RNC's digital and data operations as a new priority. It remains to be seen whether the RNC will dive deep into data, targeting and building a voter contact system as sophisticated as the Democrats' Project Narwhal, or simply update its digital operation, building a fancier front-end website and whipping up new social-media engagement tools. The RNC was high on its online apparatus in 2012, particularly its Facebook hub. But the Obama campaign's real advantage, most now agree, was in its deep and usable vault of voter information, coupled with an interface that campaign staff could use. The new CTO will "fundamentally change the role of digital, technology and data at the party committee level," Kukowski said. As the RNC focuses on reinventing itself around digital technology and data, it keeps touting the fact that it will house this purported technological revolution within the RNC, not only in an election campaign, as Obama and Democrats did last year. "This will be the first time a party committee will take on a full digital restructure in what is a space race with the DNC to have a well-oiled digital strategy ahead of the 2016 cycle," Kukowski said. The RNC's announcement leaves one question unanswered: What developer or tech-management wiz will depart Silicon Valley to try to save the GOP?